This Is Your Laugh have kindly agreed to get one of the grooms from one of their legendary stag do roastings to tell us all about it. If you’re after something a bit special for a stag do then take a look at this because it’s, frankly, brilliant. An entire evening of comedy all about you. What could be better? The groom is James (Front & centre with grey collared shirt) and I am his best man and brother. The rest of the group numbered around 30 or so, as you can imagine, my first problem was what on earth to do with so many charged and excitable hombres. I had the good fortune, a few months prior to the planned date of the stag do, to stumble across an amazing comedy experience called ‘This Is Your Laugh’. 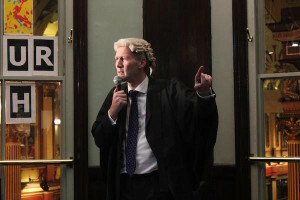 Organised by an affable and highly creative chap by the name of David Allison, the evening consisted of a mock trial where a group of work colleagues had brought three of their group up on various charges of misdemeanours in the workplace. Three comedians took the roles of Judge, prosecutor and defence lawyer while some of the colleagues were involved in presenting evidence against the accused. It was hilarious and needless to say, all were found Guilty! At this moment I realised the potential was there to recreate something similar for my brother, only this time without James having any knowledge of what was in store. Not a clue that there was going to be a comedy show all about him! We set up a Facebook group (excluding James of course) so that all of his 30 or so mates could join, share amusing stories about the stag and contribute towards the planning. After lots of banter, sharing of anecdotes, photos and conspiring, we came up with some ideas. The comedians joined the group too and in this way, they were able to fully understand the stories being revealed about James, the stag. The show’s producer, David Allison, also took the time to speak personally with many of the group gathering even more information, the little details about the 3x ‘accused’ to weave into the narrative provided by the comics on the night was a fantastic personal touch. David even spoke with girlfriends, and most significantly, James’ fiancee! With David’s direction, we decided to set up what would appear to James to be a normal stand-up comedy show. In addition to the three comics as Judge, prosecutor and defence lawyer, David brought in two extra comics. The first of these took the role of MC and provided a hilarious warm up. The second was brought up as the first stand-up act of the evening. As a comedy act alone, the evening was already going well and everyone was in stitches, during which time of course, James still had absolutely no idea of what was in store! David brought in some additional crowd members so that the audience wasn’t only made up of thestag party. This helped to add to the illusion that it wasn’t all for the stag. Then we staged an incident, with one of James’ best mates Ian heckling the comedian. The comic responded in a far from timid fashion, so much so that some of the group who weren’t in on the stunt were quite unsettled, especially James. The MC returned to try to calm things down and made a quip about needing a judge to sort out the raucous behaviour. At which point, Judge Benedict Farse stepped forward, fully equipped with wig, gown and gavel to bring some order to proceedings. It all went beautifully. James, the stag (left), was staggered and myself (centre) and Ian (right) who joined James as the ‘accused’ already had our ‘Guilty’ t-shirts on. It was only then that James began to realise something was afoot! Then came Johnny Glasgow and Martin Wyatt in the roles of prosecution and defence. A trial like no other was about to commence. The charges were announced. Air Pollution. Time Wasting. And Identity Fraud. Tales from snowboarding adventures were revealed, stories of dungeons and dragons, the infamous ‘chip incident’, of shooting the postman with an air-gun, a man who sets an alarm to change his bedsheets, and we saw the live sculpting of a beard all before the interval. What’s the tale you definitely can’t share? The second half was all about the main man, my brother, James. After it was revealed how he had been and still was wearing the ring of an ex-girlfriend, James became aware that nothing was going to be spared. This experience was more than a trial of his previous misdemeanours; it was to be a life-changing catharsis. The comedians were preparing him for a new life with his wife-to-be. We were wiping the slate clean. What’s the most embarrassing story you can tell? and the promise of a life together in the wooden shed James built at the bottom of his garden. Antonio showed the room his prized photo of the home he claimed James told him would be their love-nest. But it was a hopeless plea. In the end, my brother James has made new plans for his future, with his fiancee, Susie. How much did the whole do cost? The entire evening, from 8.30pm to 11.30pm cost just £900 (or £30 per person) which I thought was an absolute bargain when you consider all of the preparation that went into the show, not to mention the six comedians involved on the night, the sound engineer, cameraman. 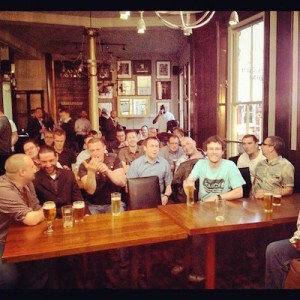 We also had a room to ourselves, with it’s own bar, in a Central London pub. Interval buffet snacks were included, commemorative t-shirts for the accused and a commemorative DVD for the stag. I seriously, cannot recommend this enough for any potential best men out there. We all had such a hilarious time I’m trying to find new excuses to do something similar again.